Brazil’s “Agricultural Miracle” credits industrial agribusiness with pulling the nation out of a recent economic tailspin, and contributing 23.5 percent to GDP in 2017. But that miracle relied on a steeply tilted playing field, with government heavily subsidizing elite entrepreneurs. As a result, Brazilian agro-industrialists own 800,000 farms which occupy 75.7 percent of the nation’s agricultural land, with 62 percent of total agricultural output. Further defining the inequity, the top 1.5 percent of rural landowners occupy 53 percent of all agricultural land. In contrast, there are 4.4 million family farms in Brazil, making up 85 percent of all agricultural operations in the country. The family farm sector produces 70 percent of food consumed in the country, but does so using under 25 percent of Brazil’s agricultural land. Farm aid inequity favoring large-scale industrial agribusiness over family farms has deepened since 2016 under Michel Temer, and is expected to deepen further under Jair Bolsonaro. Experts say that policies favoring family farms could bolster national food security. This is the eighth and final story in a series by journalist Anna Sophie Gross who traveled to the Brazilian states of Tocantins and Maranhão in Legal Amazonia for Mongabay to assess the impacts of agribusiness on the region’s environment and people. SERRA DO CENTRO, Tocantins state, Brazil – Alzira Miranda de Oliveira rocks back on her chair at the cozy stone home her husband built for the family many decades ago. She sports a charming, but incongruous, smile as she recalls a time, just a year ago, when a powerful regional soy producer association tried to get her family legally expelled from their land. With unshakeable good humor she relates how she still seeks cover whenever hearing a plane overhead – thinking would-be land grabbers are about to attack from above. Alzira and her husband live in Serra do Centro, in the Campos Lindos area of Tocantins state, Brazil. Their garden, unlike the monotonous monoculture of soy plantations common to the region, is replete with cassava, beans, rice, melons, oranges, lemons, pumpkins, yams, potatoes of all varieties, along with pigs and a few cows. Chickens confidently amble around the family farm, interjecting loudly throughout our conversation. Alzira pulls out several jars of pulses – different dried bean strands of the Brazilian staple, feijao. These help feed her family, including five children and two adoptees, and will also be sold at a local fair to earn cash. Alzira is almost entirely self-sufficient, producing all the fruit and vegetables necessary to sustain herself and her loved ones. What she does not produce, she procures by trading with the other 59 family farmers in the region. A drone’s-eye-view of this small family farming community would show a smattering of small-holdings in a vast soy sea – the large plantations that make up the Campos Lindos Project. The brainchild of then governor Siqueira Campos, the project aimed at bringing large-scale agribusiness entrepreneurs to Tocantins, Brazil’s newest state (founded in 1988) by offering financial incentives to invest in monoculture crops. Spurred by these economic enticements and low-priced land, southern Brazilian soy farmers – known as Gauchos – began colonizing Tocantins in the 90s. Alzira’s smallholding, set within a seemingly-eternal soy landscape, paints a powerful image of environmental and agricultural imbalance in the region and the modern world. The soy grown in Campos Lindos is destined for export to China and elsewhere – often going to Britain and the EU to feed chickens (claimed to be sustainably grown, but linked to Brazilian deforestation), and sold at McDonalds, Tesco and other large retailers. In contrast, the fruits and vegetables that Alzira grows feed Brazilians, and are vital to the country’s national food security. Likewise, the land conflicts seen in Campos Lindos are emblematic of conflicts raging across the north of Brazil, especially in the Cerrado and Amazon biomes, between fruit and vegetable family farmers and large-scale growers of soy, corn, coffee, sugar cane, cotton, eucalyptus, beef, pork, chicken, and other export commodities. A large home in the community of Gleba Tauá. Chickens roam around the garden and at the back there is a verdant vegetable garden. Farms like this one provide Brazilians with much of the food they eat daily. Image by Thomas Bauer / Mongabay. Many in Brazil’s entrepreneurial agribusiness elite rely on the same political narrative when defending their commodities export business model: they say they’re bringing growth, prosperity and food to the Brazilian nation, and the world. The population is growing, they say, and Brazil needs to feed the people! 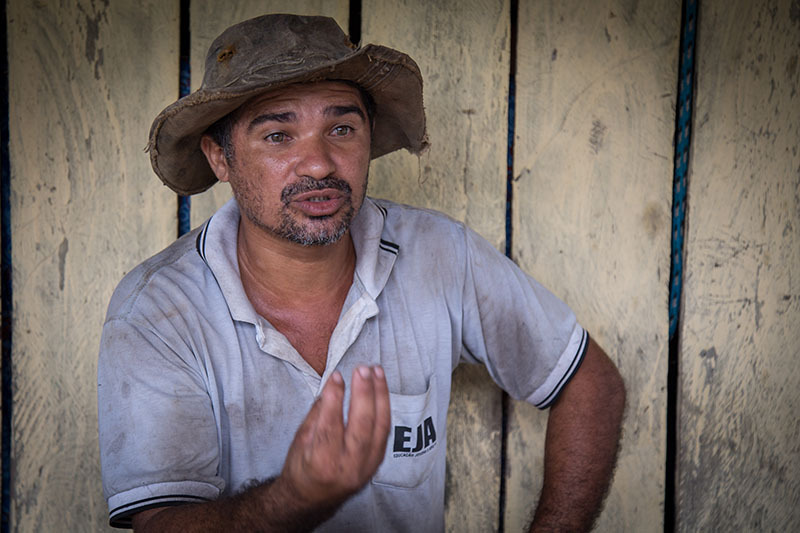 In Balsas, the agribusiness heartland of Maranhao state, I chatted with Daniel Groli, a sojeiro, or soy farmer, and member of a well-known agricultural family. 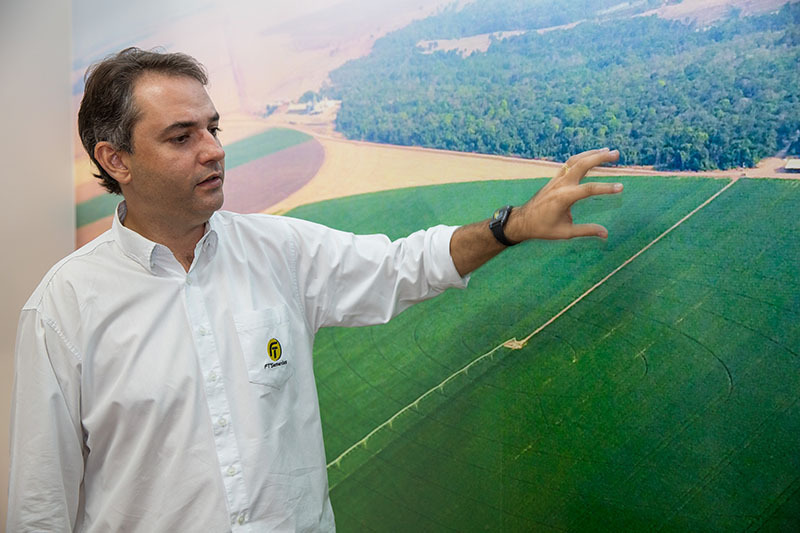 Agribusiness entrepreneur Daniel Groli points to an aerial photo showing his large soy plantations. The Groli family moved from the south of Brazil to Maranhao as part of a major migration of agricultural entrepreneurs in the 1970s and 1980s during and after Brazil’s military dictatorship. Image by Thomas Bauer / Mongabay. On the surface, the argument is compelling. With the world population currently at 7.6 billion – soaring to 9.8 billion by 2050, and 11.2 billion by 2100 – according to UN estimates, Brazilian commodities currently serve, and will continue to play, a major role in support of global food security. And what is good for the world, is good for the regional economy: “Agroindustry is the economic matrix that brings development to the municipality of Balsas,” declared Daniel Groli. And he’s not alone in this shining assessment. Many, including newly elected President Jair Bolsonaro, point to large-scale agribusiness producers as the salvation of the Brazilian economy, particularly in the past two years as the nation has climbed out of a serious economic recession. The agriculture industry contributed 23.5 percent to GDP in 2017, its highest contribution in 13 years. However, this argument also clearly serves the landed and moneyed agribusiness elites who possess the financial and political power to shape Brazil’s national narrative and physical landscape. An alliance of large-scale producers with transnational commodities companies, along with the careful cultivation of the bancada ruralista agribusiness lobby in Congress, and in state government, has given agroindustry entrepreneurs extraordinary clout. A deeper look at agricultural statistics raises questions about whether the interests of industrial agribusiness are always aligned with the best interests of the Brazilian people, and whether improved federal support for family farms might not equally serve international and national food security and Brazilian economic goals. An aerial view of Alzira Miranda de Oliveira’s community. Surrounding the mostly forested settlement is a sea of soy plantations which make up the Campos Lindos Project. Created by then governor Siqueira Campos, the project aimed to bring agricultural entrepreneurs to the newly formed state of Tocantins, and provided them with financial incentives to invest in monoculture operations. Image by Thomas Bauer / Mongabay. In Brazil, family farms stand in direct contrast to, and often in conflict with, agribusiness. Family-owned and operated farms in Brazil run the gamut, with some being large-scale, serving urban and rural markets; while many others are small-scale, land-poor operations, characterized by subsistence and non-market activities. Unlike the industrial agribusiness model – where monoculture and high profit dominate – family farming in Brazil is characterised by polycultures, several different crops planted side-by-side, with each farm typically integrated into its community. “The family and the farm are linked, co-evolve and combine economic, environmental, social and cultural functions,” writes the UN Food and Agriculture Organisation. There are 4.4 million family farms in Brazil, making up 85 percent of all agricultural establishments in the country. Though statistics vary somewhat, the family farm sector makes a significant contribution to Brazil’s national food security, producing an estimated 70 percent of the food that is consumed in the nation. However, these family farms accomplish this feat utilizing less than 25 percent of Brazil’s agricultural land. In comparison, highly capitalized, export-oriented, large-scale commodity growers hold the lion’s share of arable and grazable land. Brazilian agro-industrialists own around 800,000 farms which occupy 75.7 percent of the nation’s agricultural land, with 62 percent of total agricultural output. Further defining the inequity, the top 1.5 percent of rural landowners occupy 53 percent of all agricultural land. A sharp contrast also shows up as to what is grown: soy, corn, coffee, sugar, beef, pork and chicken are at the heart of Brazil’s industrial agribusiness supply chains. Over half of the soy, coffee and sugar produced in Brazil is exported to Europe, China and the U.S. along with other nations. On the other hand, anyone who’s spent much time in Brazil, will be well acquainted with black beans, rice and farofa (made from cassava) – most of what Brazilians eat every day. Family farming produces 87 percent of cassava, 70 percent of beans, 34 percent of rice, and 21 percent of wheat consumed in Brazil. It also accounts for 60 percent of milk, 59 percent of cow herds and 50 percent of poultry. It’s worth wondering what would happen environmentally, and to global food security, if Brazil’s diet of cassava and beans could be introduced to the developed world. Family farms in Brazil make up more than 80 percent of agricultural production units responsible for 38 percent of the gross value of agricultural production, according to the Brazilian Institute of Geography and Statistics (IBGE). As importantly, family farms create jobs, while industrial agribusiness is highly mechanized and job-poor. Seventy percent of the nation’s rural workforce is employed in family farming. One academic study found that the sector accounted for 10 percent of GDP between 1995 and 2005. The processing of farina in a family farming community in the Campos Lindos region of Tocantins state. Brazilian family farms produce 87 percent of cassava, 70 percent of beans, 34 percent of rice, and 21 percent of wheat consumed in Brazil. They also account for 60 percent of milk, 59 percent of cow herds, and 50 percent of poultry. Image by Thomas Bauer / Mongabay. Brazilian agricultural policy has long had two distinct, competing, but not always equal foci: agroindustry and family farming. In the 1970s and 80s, for example, Brazil’s military government came under heavy fire from academics for what was dubbed “conservative modernization,” a process that favored large-scale agribusiness, but excluded small-scale farmers. After re-democratization in 1985, there was a concerted effort by the government to develop more family farm-friendly government policies. In the ‘90s, President Fernando Henrique Cardoso introduced lower interest rates and a special program, PRONAF, to promote family agriculture. Government awareness that the Ministry of Agriculture had not historically provided favorable economic conditions for family farms led to the creation of the Ministry of Agrarian Development, whose sole aim was to promote family farms. In the 2000s, the bolstering of family farming was consolidated under the Lula and Dilma administrations, which provided greater resources to the sector and new programs, such as the Food Acquisition Program, by which the government bought family farm products for use by public institutions such as hospitals and schools. 2016 saw a marked shift away from family farm-friendly policies and toward agribusiness. President Michel Temer abolished the Ministry of Agrarian Development and made the body into a special secretariat, linked to the Civil House ministry which is largely dominated by agribusiness ruralists. There is also a major funding inequity. In 2017, the Brazilian Ministry of Agriculture announced a R$30 billion (US$8 Billion) investment in family farming by 2020, as part of its Family Agriculture Safra Plan; that’s R$7.5 billion (US$2 Billion) annually. This sounds significant, except that in the same year R$190 billion (US$49 billion) was released to support large-scale farmers. Simply put, the government invested 6 times more public funds in industrial agribusiness than it did in family farming. Given the large number of family farmers, higher per-hectare job production, and greater share of responsibility for the production of domestically consumed staple foods, the amount of support provided to them is insufficient. The greater resources (and clout) of the agribusiness sector of course reflects, at least in part, the benefits the export sector brings to the country. But the empirical evidence at least opens the possibility that this lopsided focus does not reflect the most efficient path to supporting food security and productivity within Brazil. The Ministry of Agriculture did not respond to a request for comment. Rice produced by a Cerrado family farm. Image by Thomas Bauer / Mongabay. While in Tocantins, I visited the Gleba Tauá community, settled over the past half century by people who laid claim to “Union Land” – property belonging to the government that can be legally occupied and homesteaded by any Brazilian. For the past three years, the National Institute of Colonization and Agrarian Reform (INCRA) has tried unsuccessfully to get Gleba Tauá approved as a deeded settlement – owned in perpetuity by the family farmers living there. However, that effort met with strong opposition. In 2015, an agribusiness entrepreneur named Emilio Binotto tried to get all the already established family farmers expelled via a judicial order. Since making his way up to Tocantins from the southern state of Santa Catarina in the 1990s, he has laid claim to several parcels of Union Land, and distributed them among his friends and family. The judge granted Binotto the decree he asked for in 2016, but the brutality of police in their attempts to enforce the ruling and eject the rightful homesteaders caused so much uproar that further legal action was suspended indefinitely. The community has since existed in a perpetual state of apprehension, awaiting Binotto’s next move. In July 2018, several settlement homes were chain sawed down by armed men, and the attack was filmed by residents and reported in the national press. The Military and Civil Police were dispatched to the community, but no one was arrested and there is no evidence that the incident is being investigated further. Cleodivan Torres Coimbra moved to Gleba Tauá eight years ago when he heard about the fertile land available in the burgeoning community. He constructed a large home, planted a prolific fruit and vegetable garden, and raised chickens and pigs. Retaining his parcel of land however, has been an ongoing struggle. Cleodivan Torres Coimbra moved to Gleba Tauá eight years ago. Retaining his parcel of land however, has been a struggle, as an agribusiness entrepreneur puts pressure on settlers to abandon their homesteads. Image by Thomas Bauer / Mongabay. As the public defender representing the community in legal proceedings put it: “Economic power allows Binotto and his lawyer to perform these atrocities. The law is the same for big or small farmers, but the application is different.” The bias of local officials, area law enforcement and courts against family farmers, and in favor of large-scale agribusiness is a common story throughout rural Brazil. Emilio Binotto could not be reached by Mongabay for comment. Analysts say that the globalized agribusiness marketplace has helped create a severely unlevel playing field: the promise of exorbitant corporate profits from commodity exports has proved very tantalizing to large-scale growers, while government institutions continue to serve well-connected, privileged agroindustry entrepreneurs over the small-scale rural farm owners and their workforce. Zezao asked me mockingly: “You think the right way to live is like the indigenous, in the forest, living for subsistence of the land? Can you imagine an aldeia [indigenous community] with 200,000 people?” The assumption is that the world’s people would starve without industrial agribusiness, and that family farm methods could not be upscaled to feed the planet. However, Zezao’s view fails to consider the devastating environmental impacts of most monoculture plantations – the deforestation of rainforest and savanna, emptying of aquifers, pesticide pollution and poisoning, unemployment, and population displacement. Downsizing Brazilian agriculture and heavily supporting the family farm model has a strong appeal to many conservationists, but such an approach has not been tried. Looming over the entire agriculture debate is climate change. Scientists have raised the alarm: continuing down a path of largely unregulated deforestation and booming large-scale agribusiness threatens deepening drought and climate chaos – a potential disaster for industrial agribusiness, as well as family farms and for the millions of people that rely on both for food. To many experts, it is becoming increasingly clear that small-scale polyculture family farming is not part of the world hunger or climate change problem, but central to its solution. Mongabay contributor Anna Sophie Gross was accompanied on her trip by Thomas Bauer, a photographer and filmmaker who has been documenting and supporting communities in the Cerrado and Amazon for over 20 years. He produced nearly all of the photos and videos for this series. Featured image caption: Alzira cooks a lunch of chicken, black beans, rice, cassava and vegetables. for her extended family. She and her husband live on a family farm in Serra do Centro, in the Campos Lindos area of Tocantins state, Brazil. Image by Thomas Bauer / Mongabay.